England put in a commanding performance in a must win game, beating Russia 3-1 to ease the pressure on them in their World Cup qualifying group, regaining top spot ahead of Wales. 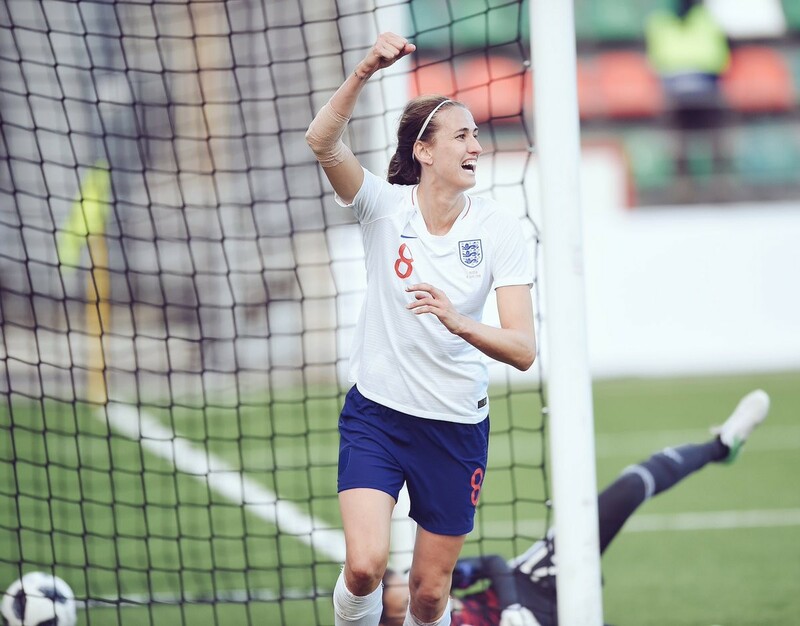 Having beaten Russia 6-0 last time they met, the Lionesses were always favourites, getting the job done in slightly more difficult circumstances to pick up three crucial points. The Lionesses started the game off as they meant to continue as they enjoyed some early possession and just getting used to it. They certainly went attacking and had Lucy Bronze getting high up the pitch. England dominated in the early periods. Russia decided to attack too which is something different than previous opponents they have faced and seemed to suit England better. Using the likes of Lucy Bronze and Rachel Daly down the wings seemed to be a good tactic early on. The first chance came when Fran Kirby crossed the ball in. However, Nikita Parris headed it wide and was also judged to be offside. Russia decided to have a go themselves. Ekaterina Pantyukhina had a hooked effort but it was just over. England started to get into the game even more with Kirby finding pockets of space and Toni Duggan putting a good pass through to Ellen White but it was just too heavy. Duggan helped to make the breakthrough though. Her cross went to Parris who just got ahead of her marker and headed it in. Just a few minutes later, her fellow Manchester City team mate got onto the scoresheet. Jill Scott latched onto Lucy Bronze's cross after making a late run into the box. Yet again, it was a header and it was Scott's 20th goal for England. Unfortunately for England, Russia got back into it through Elena Danilova. Poor defending and not being able to clear the ball has cost England before and it did here. Danilova headed the ball into the goal and broke England's run of not conceding a goal this campaign. This will definitely be something for the team to analyse and work on ready for the next match. Jill Scott restored the two goal cushion a bit later on. Keira Walsh put a good ball in for Scott with another run in and the finish was on the outside of her foot. The second half wasn't as eventful as the first although there was a fair few chances. The Lionesses really dominated this half. Russia rarely got out of their half and when they did, it didn't take long for England to regain possession. Ellen White was unlucky and probably annoyed at herself that she didn't get her goal through a diving header. However, despite the chances, England couldn't get another goal. Equally, they managed to stop Russia scoring anymore and secured the three points. Also, there was a debutant for England with Leah Williamson getting some time on the pitch. It wasn't a spectacular win like last time but it was professional and the Lionesses got the job done. Now, they will be enjoying the time off but keeping one eye on Wales. England are two points ahead but the Wales vs Russia game could play a part in what the Lionesses will do in August. One step closer to that World Cup berth but still with plenty of work ahead.